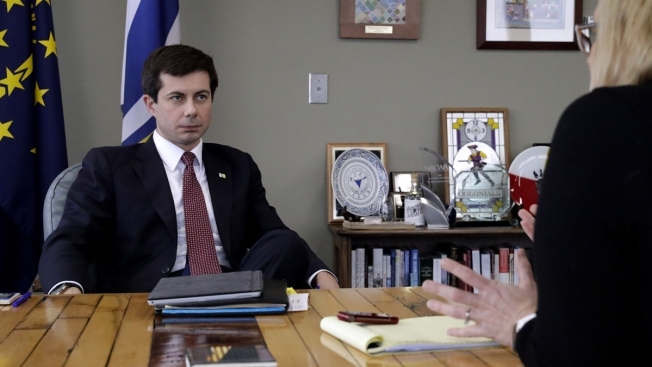 Mayor Pete Buttigieg listens to an AP reporter at his office in South Bend, Ind., Thursday, Jan. 10, 2019. Few people know Pete Buttigieg's name outside the Indiana town where he's mayor, but none of that has deterred him from contemplating a 2020 Democratic presidential bid. He's among the potential candidates who believe 2016 and 2018 showed voters are looking for fresh faces. Democrat Pete Buttigieg, the 37-year-old mayor of South Bend, Indiana, says he's forming an exploratory committee for a 2020 presidential bid.